Bristol Rovers Community Trust is launching its first walking football project. This new project has received funding from Sport England and Bristol City Council. This is part of the LOVINí Sport project. The sessions will run on Tuesday evenings from 8pm-9pm at Bristol Metropolitan Academy in Fishponds. The sessions start on 8th December 2015. In the New Year an additional session will begin on 7th January at the Goals Soccer Centre in Brislington. These additional sessions will be on Thursdays from 11am-12pm. 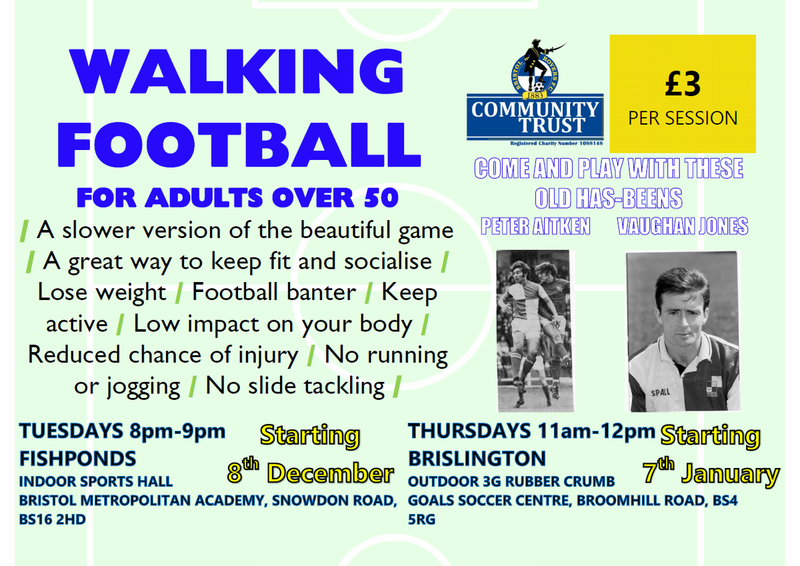 Both of the walking football sessions are for adults Aged over 50 and cost £3 per session. Fishponds sessions are in the indoor sports hall and Brislington is outside on the 3G rubber crumb pitches. Rovers legends and former captains Peter Aitken and Vaughan Jones will be both getting involved in the project so you can test yourself against and play with the old has-beens. The project has been developed to offer adults Over 50 an opportunity to involve themselves in sport in an activity that will help keep you fit and active but at the same time have a low impact on your body. The sessions offer potential for improvements in a player’s cardiovascular fitness, joint mobility and co-ordination. Walking football is a slower version of the beautiful game. There is no running or jogging as one foot must be on the floor at all times and it is a great way to keep fit and socialise. It is also a chance to get back playing the sport you love that maybe you thought your playing days were over. And the football banter. Don’t forget the football banter. Are you interested in getting involved in walking football or would like more information? You can download the poster with the full details:- CLICK HERE.